Never great when the first two results are Reddit. You know, I don’t ask for much. But when it’s the middle of August and I’m getting killed wagering on U.S. Open Series tennis, I need a chance to climb out of the red. Obviously, I’m not going to bet preseason football: That’s for suckers. 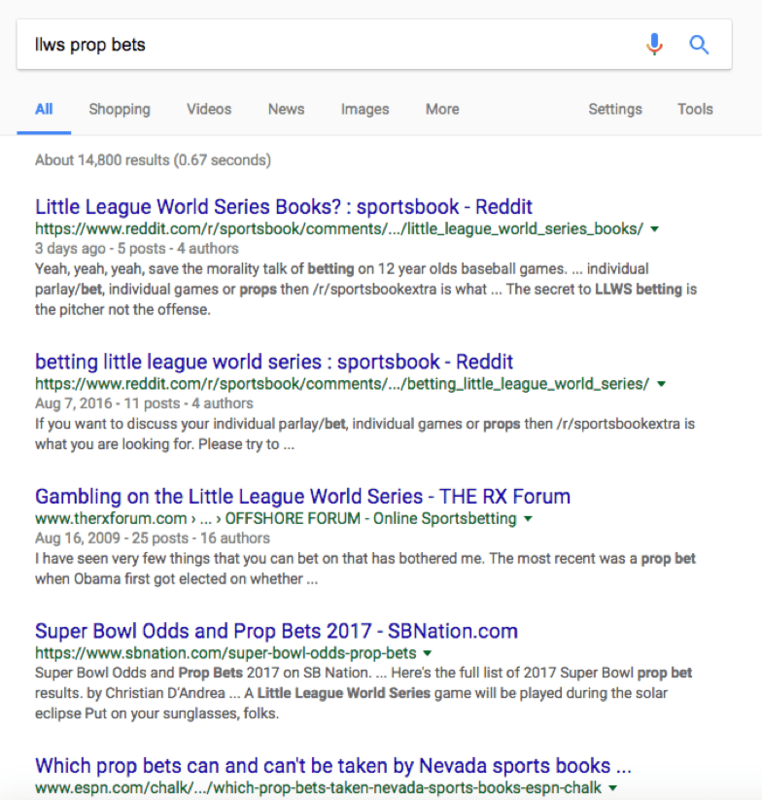 Really, the only option for degenerate gambling is the Little League World Series, and apparently—for whatever reason—that’s just not a thing. The hypocrisy appalls me. It’s glaringly apparent after one glance at the Little League Pledge, the second line of which is, I kid you not, “I love my country.” I guess I missed the executive order where Trump just said to hell with Vegas and Atlantic City for the second time. Really, gambling is an essential part of the baseball experience, like rampant steroid use or feeling economically anxious about Yasiel Puig not playing the game the right way. The fiscally responsible, myself among them, say it’s best to teach these kids proper gambling technique early on so they don’t find themselves with shattered kneecaps by the eighth grade. But more to the point: I have no idea how to bet the series this year. And while I’m tempted to keep all this research to myself, I also have to publish this article in order to have money to gamble, so I’m kind of in a catch-22. Which means…well, here’s what you should and shouldn’t do during this year’s LLWS. DO: Bet where the sun shines. Think of it as Malcolm Gladwell’s Spring Training Principle: If the state you’re betting on can support baseball in February, the kids will be that much closer to whatever arbitrary number of hours of practice you decide they need in order to master the sport. So that means go big on California and, well, just California: Arizona and Florida aren’t in the tourney this year, and placing money on Texas to be able to focus now that “King of the Hill” is potentially returning seems ill-advised. No, California is your bet, having won twice in the past decade, the only U.S. state to manage as much. DON’T: Fall into the east coast bias. Both New Jersey and Connecticut have teams in the field this year, but while New York won last year, the lesser two thirds of the tri-state area—the Emily and Anne to New York’s Charlotte Brontë—haven’t won since 1998. The struggles of the New Jersey team in particular have reportedly caused Ridgewood native Tom Emanski to make back-to-back-to-back trips to the nearby liquor store. If you or a loved one have ever received a participation trophy from Tom Emanski, please contact the CSB tips line. On that note, DO: Complain loudly about participation trophy America. If a team loses its first two games, its tournament should be over. However, while they’re eliminated, the team still gets to play a “crossover consolation game” with a team from the other half of their bracket. The existence of these games (a whopping four in all) is an abomination, and I petition we get rid off this shameful waste of taxpayer money. DO: Build a better TPP for betting purposes. Of the eight international teams in the tournament, four are from nations in the Trans-Pacific Partnership: Australia, Japan, Mexico, and Canada. Smart money is on Japan—winners of four of the past seven tournaments, and trying to bounce back from a disappointing winless effort last year—and one Pacific nation outside the actual TPP agreement, South Korea. The team from Seoul won in 2014 and was runner-up last year. DON’T: Worry about the working-class whites. No one will bet on North Carolina or South Dakota—they’re the only two U.S. states in the tournament this year to have never won the whole thing. (They also play each other in the first round.) Similarly, Michigan hasn’t won since the Eisenhower administration. Unless the umpires are David Brooks and J.D. Vance, I doubt they’ll have much more success this year. Speaking of which, DON’T: Expect great umpiring, but also, don’t get too upset about it. They’re all volunteers, and even if the volunteers are of the highest-caliber, they’re only able to umpire one LLWS in their careers. The result? Persistent turnover, and a high degree of inconsistency. However, I suggest you’re better to direct your criticism to the announcing, which is somehow never serious enough nor fun enough. I think the best solution, as always, is to let Norm MacDonald announce all the games with as little preparation as possible. DO: Win bar bets with Taiwan baseball trivia. The East Asian state has won the LLWS more than any other entrant, but not without some controversy. Starting in the 70s, Taiwan was dominant, winning—in separate streaks—and five consecutive LLWS championships. The streak was only broken due to a brief ban in the competition against international teams, implemented by organized in hopes of preventing year-round practices (even during school hours) and the use of out-of-district players. Yet they haven’t won since 1996. They left Little League from 1997 to 2003, unable to abide by the stricter residency requirements for the tournament. The assumption is that they were pulling talent from too large an area and essentially building a superteam, which would explain, for example, how they no-hit the entire competition in 1973. DON’T: Get confused by the format. Two losses and you’re out, but once you’re in a championship game, it’s winner-take-all. Lead by ten after four (or more) complete innings, and the game’s over. The shortened game holds particular importance, as it enables the winning team to save their best arms. 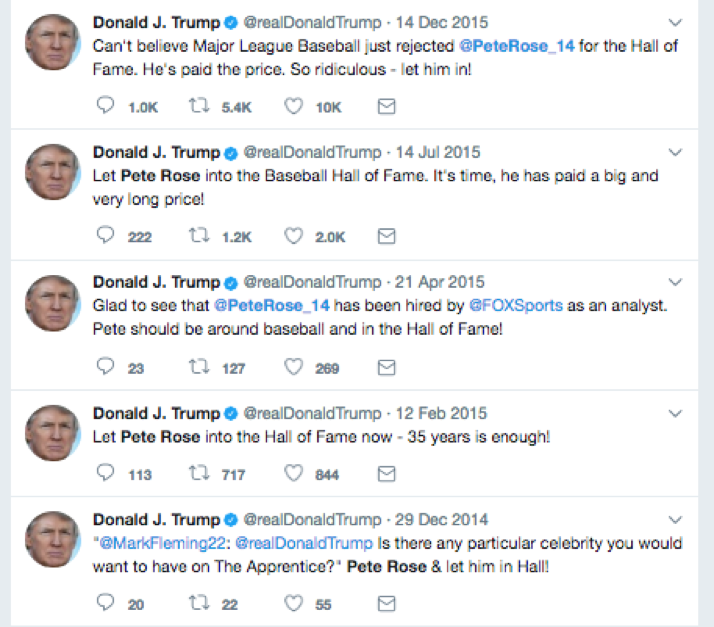 And finally, DON’T: Hesitate to click this link, showing all of our current president’s tweets defending noted baseball player and gambling man Pete Rose. As far as I can tell, Trump hasn’t yet complained that we can’t gamble on LLWS. But between you and me, the over/under on that starts at 2.5 days. Lucas Hubbard is a writer and aspiring gambler in Durham, North Carolina, whose baseball career peaked at age nine.